Does the flap of a butterfly’s wings in Brazil set off a tornado in Texas? This was the title of a talk in 1972 by Edward Lorenz, a famous mathematician and meteorologist. Can a fragile butterfly really have that much power? To be honest, a butterfly causing a tornado is more to be seen as a metaphor. But the metaphor illustrates that small differences in the initial conditions of the atmosphere can have large effects later on. Imagine the butterfly has a cold the day it could set off the tornado. Because of that it flaps less intense with its wings, causing less turbulence in the air. Then maybe this turbulence would not be strong enough to create real wind, and it dampens out instead of ultimately causing a tornado. That small differences in initial conditions can have so much impact is called chaotic behavior. 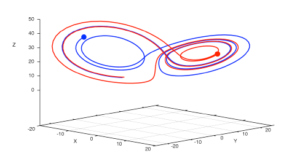 Although chaotic behavior sounds pretty chaotic, it does not mean that it is all a big mess. Models that have this chaotic behavior can still have a clear structure, and can actually look like butterflies. Fig. 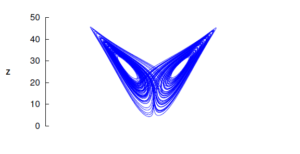 1: Lorenz chaotic model with the shape of a butterfly. Again a butterfly? Yes, but a different one. To illustrate this chaotic behavior, Lorenz designed a simple three dimensional model. For certain parameters, all trajectories of the model seem to stay in the same region. A region with the shape of a butterfly (Fig. 1). This butterfly is called a strange attractor, and it is indeed very strange. It does not have two or three dimensions, but something in between, which is called a fractal dimension. Wherever we start in our space, we will always end up in this butterfly. We cannot escape it. On the other hand, even if we start our model from two very close but different points, we will end up in completely different parts of the butterfly (Fig. 2). So small differences in initial conditions can cause large differences later on. This may seem very abstract and something that should not keep us busy, but the truth is that it appears everywhere in nature. The weather is the perfect example. Chaos is what makes the weather so difficult to predict. Even if we have a small error in our measurements of temperature, this can cause a completely different weather forecast days later. The job of a meteorologist is not an easy one. Lorenz showed that making a forecast for more than two weeks is quite impossible, something we often experience firsthand. Is it all a hopeless case, or can we try to improve our predictions? Of course modelers are trying to improve individual models, which results in better forecasting. And recently something new has been proposed. To not only work with individual models, but to try to combine the models and create a so called supermodel. The supermodel uses the strengths of each of the models. Because of that it is better than the individual models. Super indeed! This supermodeling idea was first tested on small systems like the Lorenz butterfly and now we are moving on to the real state-of-the-art weather models. So where does this leave the butterfly? A butterfly might not be able to cause a tornado. But to illustrate the effect of chaos and to have a simple but very nice testing model with this shape it is very useful. Hence, the butterfly can be powerful, but not as we may first have expected! 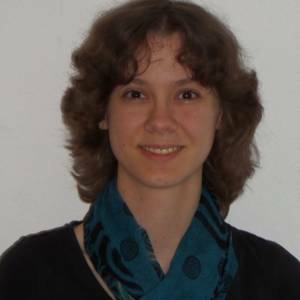 I am a PhD student at the Geophysical Institute in Bergen. I come originally from the Netherlands, where I studied mathematics. Now I am applying my mathematical skills to the new concept of super modeling: combining different weather- and climate models dynamically in order to improve predictions. Tagged butterfly effect, chaos, Climate Models, super modeling.